Transmissive beam integrators are used with laser applications requiring a relatively large, focused flat-top intensity. Faceted integrators focus a high-power beam to a relatively flat-top beam with a size and shape that is equivalent to the individual facet size and shape. Traditionally, it has been extremely difficult to produce transmissive faceted integrators. Today, however, these faceted integrator lenses are made using advanced diamond-turning techniques. 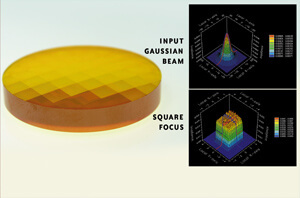 Although the primary substrate material for faceted integrator lenses is ZnSe, it is possible to produce this surface on Ge or any other diamond-turnable material. Faceted lenses are a good alternative to the faceted mirror. Facets are arranged on the lens surface in almost any shape or form. There are some practical limits to the size of the facets that are machined, but typical facet sizes of 2 to 8 mm are possible on mirror blanks up to 100 mm in diameter. Transmissive beam integrators produce relatively flat intensity profiles. Integrated beams can be square or rectangular. Focused beam sizes are relatively large -- 2 mm and above -- and are ideal for welding and heat treating. Degree of integration will depend on noncoherence of the laser beam.